This annual publication highlights the actions of the Board of the Canadian Blonde d'Aquitaine Association to streamline the inner workings of the Association. Show results, the Sire Summary, Breeder listing, and any other information/articles that are Blonde related or could be of value to people interested in our breed. 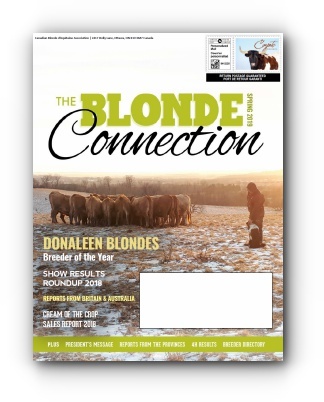 We hope our readers will enjoy this publication, and our breeders will see fit to promote their programs through the Blonde Connection. The Association would like to thank those who choose to advertise in the Blonde Connection, and for making it possible to bring the Blonde voice to the purebred and commercial industry. The editorial will provide you with information to better assist your operation which, in turn, ensures the growth of the breed in Canada. The best opportunity to reach a wider Commercial and Purebred Blonde audience with an expanded distribution in relation to the member newsletter. Every member (those listed on CLRC website) will receive a hard copy of the magazine. Every person who has had a Blonde animal transferred into their name by the CLRC in the last five years will receive a hard copy of the magazine. Hard copies will be sent to commercial mailing lists in each of the provinces (where available). Each Province will receive copies for distribution at trade fairs. Virtual copies will be available on the CBDA website and any other Blonde websites that wish to post it. Emails will be sent to international interests directing them to the on-line version. This publication will include all show results and champion pictures (when available), bull test results, a breeder list, sale reports, blondes in 4-H reports, pictures as well as other fun and interesting Blonde related articles. DON'T MISS OUT! The most recent issue of the Canadian Blonde d'Aquitaine Association's Newsletter is now available online in PDF format. Please click the link below to read the Winter 2018 Newsletter. You must have Adobe Acrobat Reader to view the Newsletter in PDF format. PLEASE NOTE: Deadline for the Summer 2019 newsletter is June 1st. Please send your advertising copy to Angela Morasch as soon as possible. Since the summer of 2006, the Association has offered a newsletter for our members. It is distributed in the Summer, Fall, and Winter, enhancing the Blonde Connection that is distributed in the spring. Designed and edited by Coyote Publishing of Pincher Creek, Alberta, the newsletter features events, articles, and programs of interest to members of the Canadian Blonde d'Aquitaine Association. The newsletter is e-mailed to all members with e-mail addresses, and posted on the Canadian website. Those without an e-mail address receive the newsletter by Canada Post. Forward ideas for articles to the Canadian office. * Bleed to edge (8½" x 11") on all full page ads. All ads are full colour. Ad rates are for camera-ready. Ad rates are subject to 5% GST. All ads must arrive camera-ready. Ad content must be received through e-mail, Canada Post, or a CD. Ads will not be considered sold until payment has been received. Cheques must be made payable to CANADIAN BLONDE D'AQUITAINE ASSOCIATION. Please mail cheques to Angela Morasch, Coyote Publishing, Box 1147, Bassano, Alberta T0J 0B0. Quantity published: Approx 200 + downloaded free on the internet. The newsletter is usually around 18 pages in size; additional pages will be added only on the addition of advertising content, or at the direction of the Board of Directors. Questions? Contact the Newsletter Editor by phone at 403-793-7791, or by e-mail to blondenews@coyotepublishing.ca or the Association office at cbda@clrc.ca. HELP US HELP YOU PROMOTE YOUR LIVESTOCK OPERATION!